Instrument panels on motorcycles not only provide you with essential information such as speed and fuel usage, but can also provide you with warning symbols. It’s important to gain familiarity with the motorcycle instrument panel, switches and gauges before riding. Doing so will provide you with better control of the vehicle. Though most instrument panels are similar, some manufacturers use different methods for providing the rider with information – for example, a digital display may be used instead of the more traditional dial gauges. This guide provides the novice rider with an explanation of a typical motorcycle instrument panel. An Instrument panels layout may vary depending on the make and model of motorcycle. 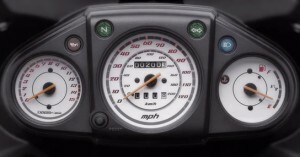 A typical motorcycle instrument panel has a speedometer, a rev counter and often a fuel gauge. Some models may also have a temperature gauge to warn the rider if the engine is running too hot, though this may be represented as a warning light on certain models. Other visual aids will include warning and information lights that use symbols to inform riders that a system is active or that something requires your attention. This is often a prominent dial, though some models may use a digital display. The speedometer informs the rider of the current speed of the motorcycle in mile per hour (mph) and kilometres per hour (km/h). Most gauges display both mph and km/h, whilst the digital display variety often has the ability to switch between mph or km/h, whichever the rider prefers. 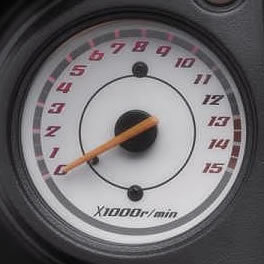 Two milometers, or odometers as they’re also refereed to are usually housed within the speedometer. One milometer is used to record the total amount of miles or kilometres the vehicle has done in its lifetime and the other milometer can be used to record the length of specific journeys. This can be a useful tool for calculating fuel consumption and distances. The rev counter informs you how fast the engine is working in revolutions per minute (RPM). The higher the RPM, the faster the engine internal components are working. The higher the RPM, the more fuel is used and as engine components are moving extremely fast, the more heat is generated. A very high RPM will see the rev counter ‘go into the red’. This is reaching the maximum RPM that the engine can manage. Keeping an engine consistently in the red will cause significantly more stress on components, leading to a higher chance of engine failure. Most modern engines have a rev limiter that safeguards the engine from exceeding its maximum revolutions, therefore reducing the risk of engine failure. If the rev limiter activates, there will be an immediate reduction in power and often the engine produces an unusual noise. In this situation, you have two options, either change up a gear or close the throttle. Either option will slow the engine speed down to a safe RPM. 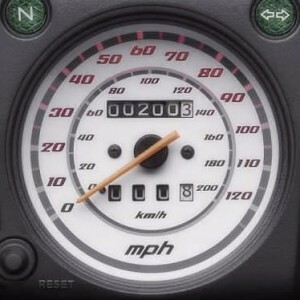 The majority of modern motorcycles are fitted with fuel gauges. 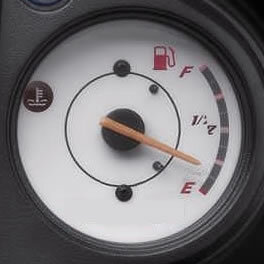 Older motorcycles used to rely on the rider either needing to open the fuel cap to visually see how much fuel is remaining, or to calculate fuel consumption based on mileage. Motorcycles may or may not be fitted with a temperature gauge. If a motorcycle doesn’t have one, it will use a warning light to inform the rider of increasing temperatures instead. If the temperature gauge is approaching the red, or if the warning light illuminates, safely pull over and turn off the engine when as soon as is safe to do so. Prolonged vehicle use may see damaged engine components or a complete seizure of the engine.